Even with short surveys, translation management is always a chaotic and time-consuming task. The idea that the programming of the survey only begins once the questionnaire has been 100% coordinated with the end customer unfortunately hardly ever works in practice. While the translators are already working on their texts, there are already changes. New questions are added. Answer options are reformulated, other questions and answers are deleted and no longer needed. The poor project manager (left in the picture) has his hands full coordinating the changes with the project team and the translators. Excel files are created which contain many markers for changes. Even if the most recent version of the German master text is visible online, the translator cannot see what has changed since his last translation. To make sure that everything really fits at the end, there is also a time-consuming check in which all texts are checked again and adjusted. Unfortunately, this is still common practice even today. International studies in Europe are usually conducted in about 30 languages. But also in countries like Luxembourg or Switzerland 3 languages are common for every project. Even with 3 languages the translation management is already quite a mess. One of the problems is that many translation companies do not have adapted processes for market research. Translating a market research project is fundamentally different from translating a book. Books (even manuals or software documentation) are relatively static and rarely change after the start of translation. Survey projects, on the other hand, are very agile right from the start. SmartTranslate was developed by us precisely for this reason. and therefore works directly with them. Even today, translators still work with Excel or Word for the actual translation work. There is nothing wrong with this, as long as a fixed structure is used. SmartTranslate is the link between the survey systems and the translators. Workflow that is adapted to changes. 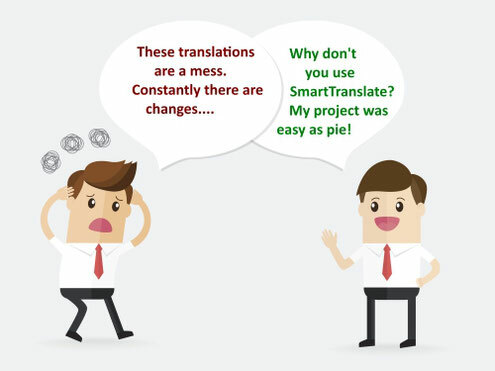 With SmartTranslate you don't even have to try to avoid changes to the current project. Because we have designed the system from the gound up so that there will be changes. That's why we support project managers and translators optimally with the information they need. Technical quality management is an important aspect of all online surveys. Translators are usually not HTML experts and cannot pay attention to everything a programmer has built in. SmartTranslate helps to easily identify and fix problems like the needle in a haystack. With SmartTranslate you have all these problems under control. Even if a question that has already been translated is changed in the main language, SmartTranslate can help the translator. He sees the new AND the old label in the main language. All he has to do is correct the translation. This saves time and helps to avoid mistakes. Then the best way to contact us is to use our contact form. We will gladly show you SmartTranslate in action in a webinar.